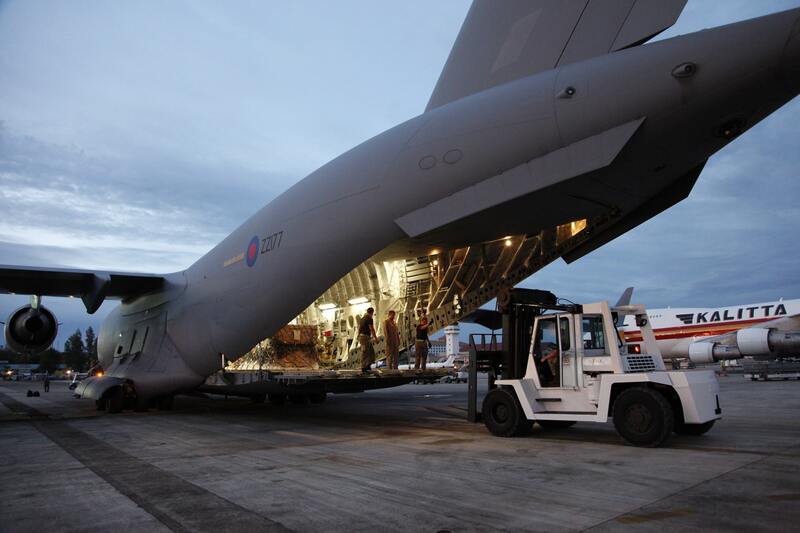 British humanitarian aid is unloaded from an RAF C-17. A Royal Air Force C-17 transport aircraft departed from RAF Brize Norton early on Monday the 16th of March and will travel to the Royal Australian Air Force base at Amberley in Australia. The aircraft is carrying shelter kits, solar lanterns with mobile phone chargers and various other pieces of equipment and personnel such as an expert from the Department for International Development to assist with field assessments as part of an international Cyclone Pam relief effort. The terrible effects of Cyclone Pam are now clear and many people are in urgent need of relief. The Royal Air Force’s swift and invaluable support will ensure victims of the cyclone get the help they need to start putting their lives back together. Families’ homes have been destroyed and power supplies are down. Our emergency shelter kits and solar lanterns will help meet people’s basic needs and Britain stands ready to assist further.